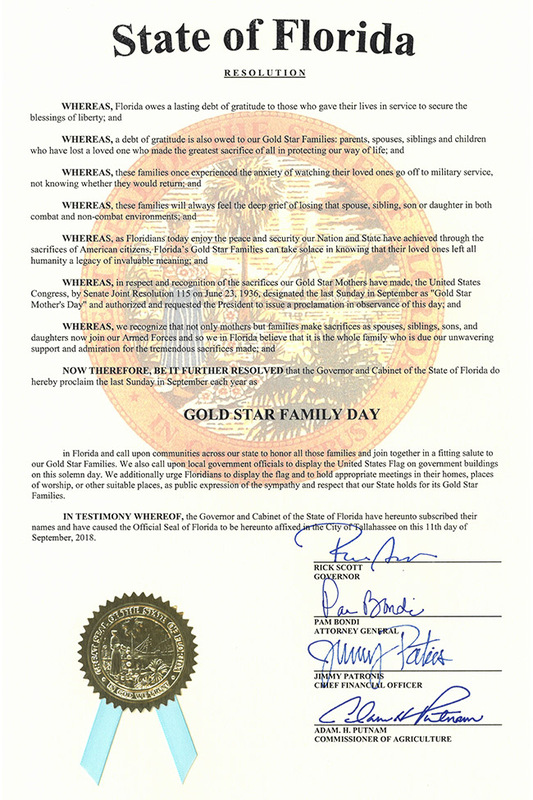 Florida honors its Gold Star Families. Losing a loved one is one of the most difficult things anyone can go through. Florida Survivor Outreach Services (SOS) connects you with people who can help you move forward and find strength. SOS Support Coordinators are located strategically throughout Florida to provide long-term support and assistance to Families of the Fallen. Provide expertise on State and Federal survivor benefits. Provide guidance and assistance to the family in regard to entitlements and local resources. Arrange for estate and financial advice when requested. Educate the military command, community social services and support agencies of the needs of our military survivors. Form networks and support groups so survivors will have peer support readily available. Connect survivors with appropriate mental health support/counseling as requested. Supply survivors with resource referrals for peer support, bereavement counseling, emergency financial services, Tricare, educational benefits, military reports and military benefits. The Gold Star license plate is a special license plate developed to honor the family members of a servicemember killed while serving in the U.S. Armed Forces. For more information, visit https://www.flhsmv.gov/specialtytags/miltags.html. Consult the following websites for assistance and additional resources.